Quadrant Shower Enclosures are an excellent addition into any bathroom space. Perfectly suited to smaller bathroom and en-suites - they operate with a sliding glass door, making them a fantastic space saving option. As well as being suited to smaller bathrooms, these enclosures also work very well in contemporary bathrooms. Although not taking up a massive amount of floorspace, these enclosures still deliver in terms of showering space, thanks to their clever design. As an added bonus, the clever design of these shower enclosures also means that they are very easy to both clean and maintain. All of our Quadrant Shower Enclosures have been handpicked from the world’s leading designers of bathroom and shower products - and are available in a wide range of designs and finishes. Brands featured within the collection include Kartell, Lakes and Scudo. Some of the most popular finishes include Chrome and Silver, with popular designs including Double Door Quadrants, Single Door Quadrants and Slider Shower Doors. If you have any questions about these products, please do just get in touch and we will be more than happy to help. Wet Rooms are the ultimate in contemporary bathrooms, and represent the ideal upgrade for bathrooms, shower rooms and en suites of all shapes and sizes. Wet Rooms are both highly functional and stylish, and our range of Wet Room/Walk In Shower Enclosures and Screens make the perfect addition in creating your wet room showering space. These enclosures and screens are perfect for almost all sizes of wetrooms, and work perfectly in either small en suite wetrooms or larger wet rooms as a bath replacement. As well as looking fantastic, these screens and enclosures also play a key role in containing shower spray - preventing the rest of the wet room, from.. getting wet. This stops your towels getting soggy, or water resting on your bathroom furniture. All of these screens have been handpicked from just a couple of our most trusted brands, who we know deliver excellent quality products which also look fantastic. These brands include Lakes and Scudo, who provide enclosures in both Silver and Chrome finishes. If you have any questions about these enclosures, or help in choosing a shower solution for your wet room - please just get in touch and we will be happy to help. Bi-Fold Shower Doors and Enclosures are the perfect addition to a smaller bathroom, shower room or en-suite. They have been designed with incredible attention to detail with regards to space saving, whilst providing a large showering area. The design of the doors eliminates the requirement for space for a shower door to swing open, meaning these shower enclosures can be installed near or next to other pieces of bathroom furniture. At Designer Bathroom Store, we have an excellent range of Bi-Fold Shower Enclosures, handpicked from just a small range of suppliers. These suppliers have been chosen because they provide excellent quality products, with a beautiful design and at an excellent price point. Finishes available within this collection include both chrome and silver, and bi-fold shower doors are available in frameless and framed options. As to be expected a range of sizes are also available. Pivot Shower Doors, also commonly known as Hinged Shower Doors come in a variety of shapes, styles and sizes - making them suitable for almost any shower space. Handpicked from just a few trusted suppliers, we source and supply an excellent quality range of Pivot Shower Doors. Available in both framed, and frameless options - popular finishes include both Chrome and Silver. There’s over twenty of these products in stock, so just browse the range and let us know if you have any questions which need answering. At Designer Bathroom Store, we source and supply an excellent range of corner entry shower enclosures. These enclosures are perfect for those who want a shower enclosure, but whose bathrooms mean that entry to the enclosure would be difficult. Instead of using the usual pivot doors for entry, both sides of corner entry enclosures contain both the static side of the enclosure and part of the doors. Although this sounds a little complicated, using these enclosures could not be easier - simply slide both of the closest panels away from you to open the enclosure. This range of enclosures is available in almost any size, ensuring you can find the right enclosure for your bathroom - large or small. All of our Corner Entry Enclosures have been handpicked from just a few suppliers, including Lakes. A range of finishes are also available. Many of our customers choose to replace their enclosure as part of a new bathroom suite, or in some cases simply a refresh and a change of design. If you have any questions about this range, please do just get in touch and we will be more than happy to help. Sliding Shower Doors are one of the simplest types of shower door/enclosure on the market. They work best in medium to large bathrooms, which holds a large showering area. Adding a luxurious feel to a bathroom, they help create a roomy, contemporary element into your bathroom design. Most of our Sliding Shower Doors are reversible, so can be either opened on either the left or right hand side. All of these designs are available in both framed and frameless designs, and are available in a wide range of sizes - suitable for almost any showering space. Finishes available include Chrome & Silver, and all of our Sliding Shower Doors have been handpicked from just a few chosen suppliers. These suppliers have been chosen thanks to their excellent quality, design and also price point. If you have any questions about purchasing a Sliding Shower Door for your bathroom - please do just get in touch and we will be more than happy to answer any questions you may have. Shower Trays provide an essential function in any bathroom. 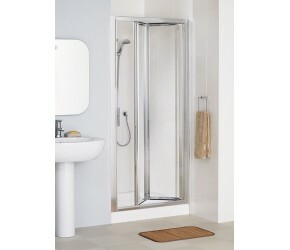 Providing a comfortable, easy to clean and stylish part of any bathroom which includes a shower. Not surprisingly, there’s a massive range of Shower Trays to choose from, and we are proud to stock a great collection to choose from. Regardless of whether you are removing your bath, replacing your bathroom suite, or simply replacing a broken Shower Tray, there’s the perfect product for you. There’s a range of materials available, including very popular stone resin - which provides an incredibly luxury appearance, whilst providing a very stable footing. 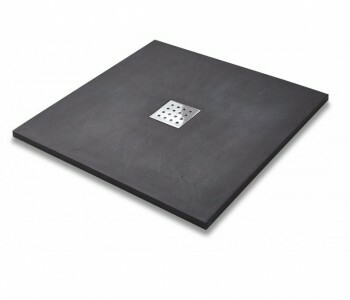 These shower trays are also available in Quadrant, Offset, Square and Rectangular Shapes. As always, we have handpicked just a few suppliers - who we trust to deliver exceptional shower trays which stand up to years and years of use. If you have any questions about this collection, just get in touch and we will be happy to answer any questions you may have. Shower Side Panels play a key part in both the performance and style of your Shower Enclosure. Used to fully enclose your shower unit, they keep the water in the right side of the shower, whilst looking brilliant. Naturally, a wide range of sizes are available for any enclosure, and we have handpicked just a few shower side panels and screens - which provide reliable, safe and stylish performance. As well as the standard range of glass panels and screens, there’s also a few extra special models within the range - some of which have mirrored finishes allowing you to add a useful mirror into your bathroom. If you have any questions about this range of side panels, please do just get in touch and we will be more than happy to help with any questions you may have. Choose from a wide range of shower doors and shower enclosures available from carefully selected, quality manufacturers. With so many styles and sizes available, you can be sure to find the ideal shower enclosure or shower door to suit your needs. From sliding shower doors to, walk in shower enclosures to mirror finish glass panels, we have something for everyone. We also have a wide range of shower trays including square shower trays, quadrant shower trays, rectangular shower trays and accessories.